While Zelda: BoTW seems to be a very expensive endeavor for Nintendo I don't think is as expensive to make as, let's say, Assassin's Creed. I doubt anything made in Japan has the annual production budget of something like Assassin's Creed. Not BOTW, not MGSV, not DQXI, not even FFXV. An annual series (usually) with a staff in the thousands is incredibly costly. Pokémon is the closest thing. I think despite what Takahashi says the Xenoblade games are clearly higher budget than most JRPGs. They might not have a massive team but they have much longer periods of development than most JRPGs. WoFF is aimed at kids but its selling point is based on characters nostalgia that kids couldn't possibly have. I honestly expected it to do worse. It also released on platform where the kids market is not particularly there. I don't think it would have done much better on the 3ds though. The game would've been better suited on the 3DS instead of on both PS4 & PS Vita. Four years of development with 100 Japanese staff drawing Japanese salary is still nothing compared to three years of development with 1000+ staff all over the world, with a bulk drawing salaries in US and Europe. Don't worry, it will get a second chance on the NS heh. I've been playing the PS4 Platinum Stars game. If you like rhythm games, and the 765Pro team, it's good enough - there's not much of a story mode though if that's what you're looking for. That's region free. The popular Cinderella Girls Starlight Stage is JP-only, but there are workarounds to play it. Also rhythm based, it focuses on the Cinderella Girls and has 'story' locked behind player levels and regular events. Uses a free-to-play gacha model for microtransactions. Why do we Nintendo fans have to suffer? We already had our share with FFEX. Oh for sure. I just mean they're clearly somewhat higher budget than something like Tales. Persona 5 is probably around the same(or maybe higher). L~A requested this comparison two weeks ago (sorry for the delay). 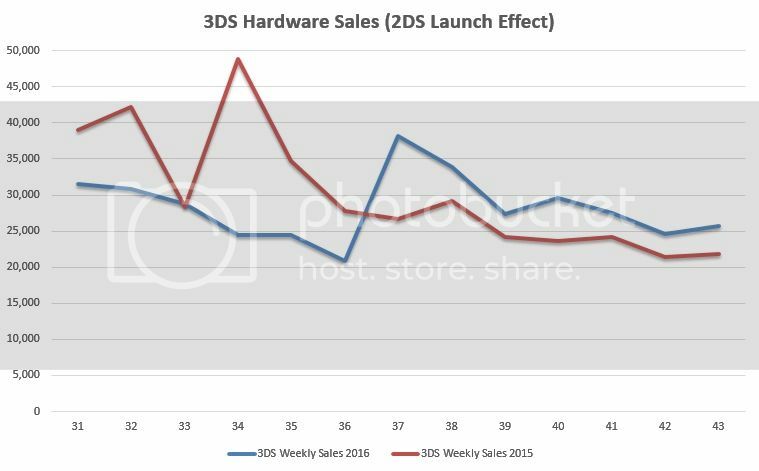 2DS was launched in week 37, and since then, 2016 hardware sales have been outselling last year period. Oops, forgot to comment on that. Thanks a bunch for the graph, basically confirms what we've seen with weekly data. Nintendo really played their hand well with the 2DS. It's not setting the charts on fire, but it's selling enough to make a noticeable difference. Chris's Famitsu data for October also shows a similar increase. But what's interesting about that is that even without the 2DS, sakes would have very slightly up / stable Year on Year... was October 2015 really that bad a month? It's not like October 2016 had any major title other than MHS, and that one wasn't really a system-seller (though the game itself sold rather decently). Let's see what happens in November and December now. Persona 5 took so long to come than it's a hard catch to tell how much it really cost Atlus. I don't remember exactly the context of Takahashi's comment, but he probably wanted to say that Xenoblade X development cost was close to the original Xenoblade and probably even below any middle tier franchise from the west. A good comparison could be Trusty Bell where Tri-Crescendo poured all its ressources and took them a few years before the game was released. I read it's region locked and that you need a VPN. But I guess I can try. are we going to have some info about new supply of PSVR in today's numbers? At least the drop is smaller than UK. It went from 160k to 100k. Yeah, I'm sure the Tales studio would love to have a four year development timeframe. It's probably worth noting that Monolith didn't get that long with Bamco either bad in the day.